Anybody who has followed my career and what I’ve said about crankbait fishing over the years knows that I always want to change direction with my crankbait as I wind it back to the boat. I can’t remember a time when I threw one out and just brought it back through open water. As far as I’m concerned that’s a wasted cast. There are a lot of ways to get a change of direction. You can move your rod tip left and right, or up and down. That’ll work. But, the easiest way is to just bang it into something. It’ll deflect naturally and in a way that’ll trigger the predator instinct of a bass. That’s the way I do it whenever I can. The reasons why I do that are obvious if you watched our latest episode of Going Ike!, Landfill Bass. We were fishing a well-managed landfill lake in the fall that was full of bass. They were stacked up, right outside the bays, cuts and creeks. It was a classic fall transition situation. The fish were moving from their summer holding areas but weren’t yet into their full, crazy fall feeding patterns. If they had been actively feeding, it would have been a perfect setup for a video show. But they weren’t. So, we had to do something to trigger their predator instinct — make them bite. 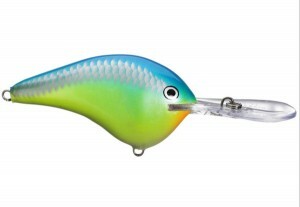 I reached for a crankbait. It’s the best reaction bait I know about, especially when there’s rock on the bottom in 5 and 6 feet of water like there was in our landfill lake. The situation was perfect for a crankbait that had a running depth of around 6 feet. We selected an Ike’s Custom Ink color, blueback herring. It looks like a blueback herring but it also qualifies as a great classic shad-type of color. Better yet, it matched the local forage, size and color perfectly. We used Abu Garcia composite rods that have a really nice parabolic bend. They’re part of my Signature Series that I designed just for this type of fishing. Check them out if you’re in the market for a new crankin’ stick. I’m going to be brutal here: I know glass rods are popular for crankbaiting, but I’ll put the composites we offer up against any rod you can buy or make. Our rods will give you the same delay that you need when you’re fishing crankbaits but with the added advantages of being more durable and cost effective. Mount an Abu reel spooled with Berkley line to one and you have as good a combination as can be bought. What I just described is the same tackle I use to compete on the Bassmaster Elite Series. If there was anything out there that would help me catch more fish, I’d be using it — and I’m not. Give this technique a try when you’re faced with the same or similar conditions. At the end of the day you’ll be glad you did.